Is there any Andorid Application that can be used to edit Blogger Template? There are several android application that can be used to view or edit Blogger template. 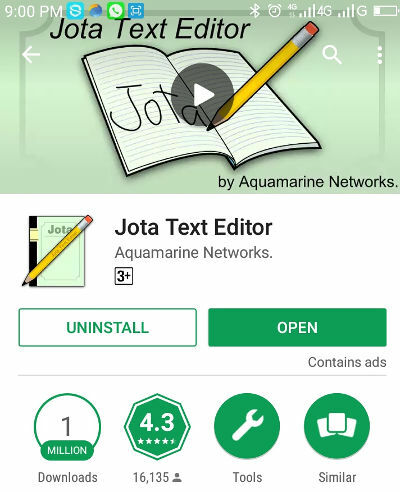 Among of them i choose Jota Text Editor. I've tried many other android application to view XML file of Blogger template and found that Jota Text Editor do the job very well. It fast, reliable, colorized code, easy to customized and easy to navigate. It has been downloaded by more than 1 million android user. In previous article i share information about software to edit Blogger template. Notepad++ is software that can be uses to view and edit file XML Blogger template. 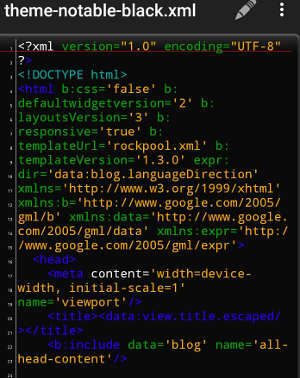 Blogger template are coded in XML. Understanding the blogger template code is very important for Blogger. In some level we need to write some code in our Blogger template at least for creating menu or add the Google AdSense script. We as Blogger that choose Blogspot or Blogger as our blogging platform, must understand the blogger template code. That's why i like to read Blogger template code. I need to understand how this code will impact to my blog appearance and performance. I like to read the blogger template and tweaking the template to get the appearance that i want. Sometime i read the code in my smartphone and try to understand the code structure. Please try it and share your tought. 5 Responses to "Android Application To Edit Blogger Template"
sir want to know which theme you are using for your website ? please suggest me.